This Strong tubular framed poster A-board is used extensively in high streets and shopping centres. 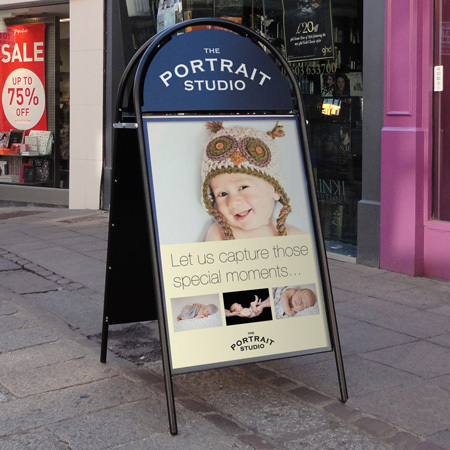 Fully vinyled or digitally printed at the top in your own specified design. The main body on both sides can contain and avertise posters while the top plate advertises the name of your business. Comes in 2 different colours - white and black. 25mm diameter tubular frame for prestige locations. Dome top logo plate ideal for vinyl graphics at top. Please select the size and colour below. Artwork will be drawn up for your approval and 1 amendement can be made to get the artwork to your desired requirement. Please choose quantity and delivery options from the check out area.